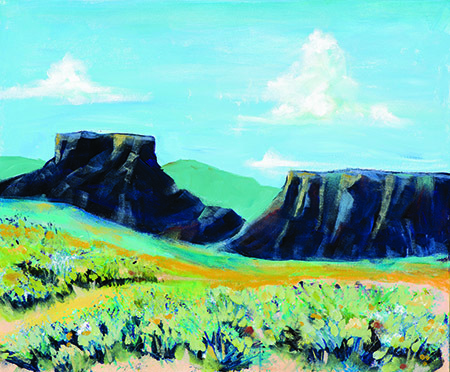 Dorothy Holmes of Tall Girl Studio has been painting most of her life. She was lucky enough to travel around this country and others growing up with parents who showed her the beauty of nature and now transfers that beauty and the love of birds onto Canvas. Sometimes her birds and other creatures will be sitting alone and sometimes you’ll find them nestled into a woman’s hair. 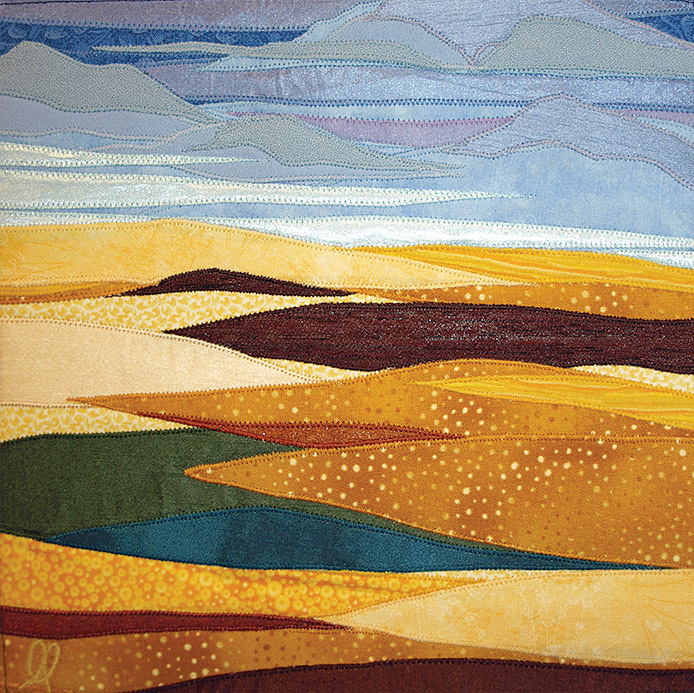 Dorothy is known for her contemporary abstract landscapes featuring vivid colors and unique textures. Dorothy is very proud to be featured in the HGTV series that was shot here in Bend and to represent Oregon in A Women’s Perspective, a fine art gallery show in New York during last March’s women’s history month. www.tallgirlstudio.etsy.com. Transition paintings by Renne Brock, Dory Hethcote and Sharon Tillinghast. Artists will attend the opening on First Friday. Brock states that her art is often a response to the dynamic and inconsistent actions our society demonstrates through these times of Transition. The artist’s “intellectual toolbox of processes includes color, which provides the emotional aspect of an image and change, the willingness to consider alternative outcomes, both of which make life’s journey in art a series of adjustments. Hope and acceptance guide us to the end result. Celebrating these processes, the artist presents two new paintings, Surprise and Vibrancy in Color. The Franklin Atrium (and Bond St. entrance) exhibition is open from 7am–7pm. Billye Turner, art consultant, coordinates the its exhibition schedule with info at billyeturner@bendnet.com, 503-780-2828.
spaces, Emerson’s empty circus rings and shadowy interiors of the big top have a haunting quality, as though the performers have just exited for the final time. The few scenes still inhabited by show horses, lions and elephants feel almost like a mirage. Her series of acrobats, reduced to simplistic cut out shapes, feel like a visual memory of the danger and risk taking that were permitted under the big top. 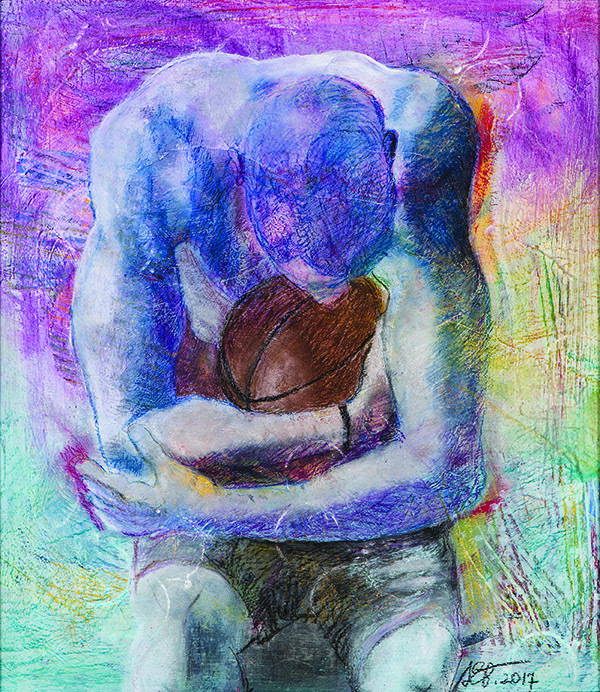 Using innovative combinations of pastel and monotype, Emerson captures a time, place and feeling that lives on in our imagination. 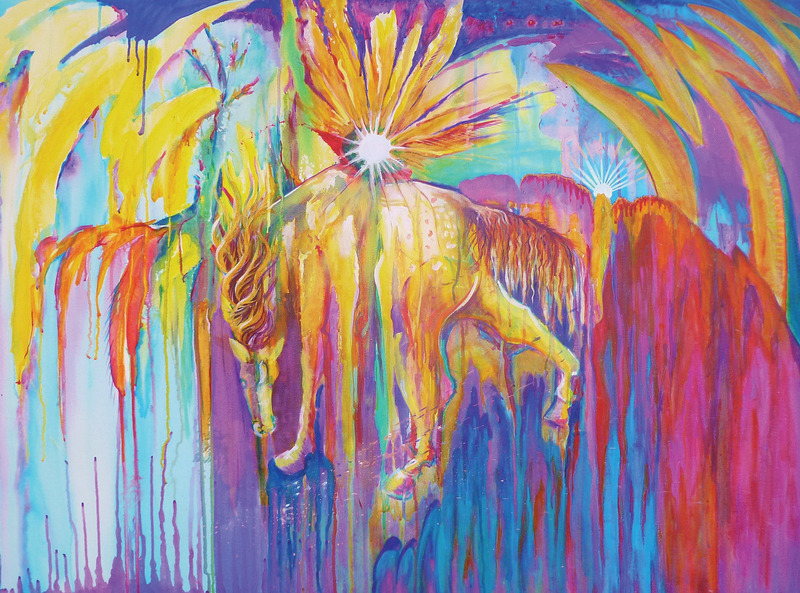 The October 6 opening reception for Cirque d’ Art features an outdoor performance by Central Oregon Arial Arts, as well as a print demonstration by October’s featured A6 member Helen Loeffler. Loeffler’s recent prints (created with electro etch) will be on display in the A6 Print Studio in October. Admission to the opening reception is free. Dawn Emerson will give an art talk at Bend Art Center on Friday, October 13 at 6pm. Admission to the talk is $5. Bend Art Center will offer several circus-themed community art classes, talks and school programs in connection with the Cirque d’ Art exhibit. 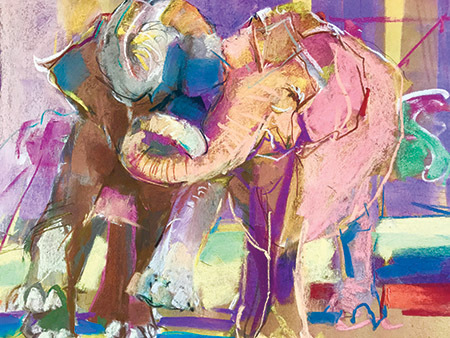 Emerson will share her creative pastel and monotype techniques in a workshop November 4-5. Featuring Betsy Bland. 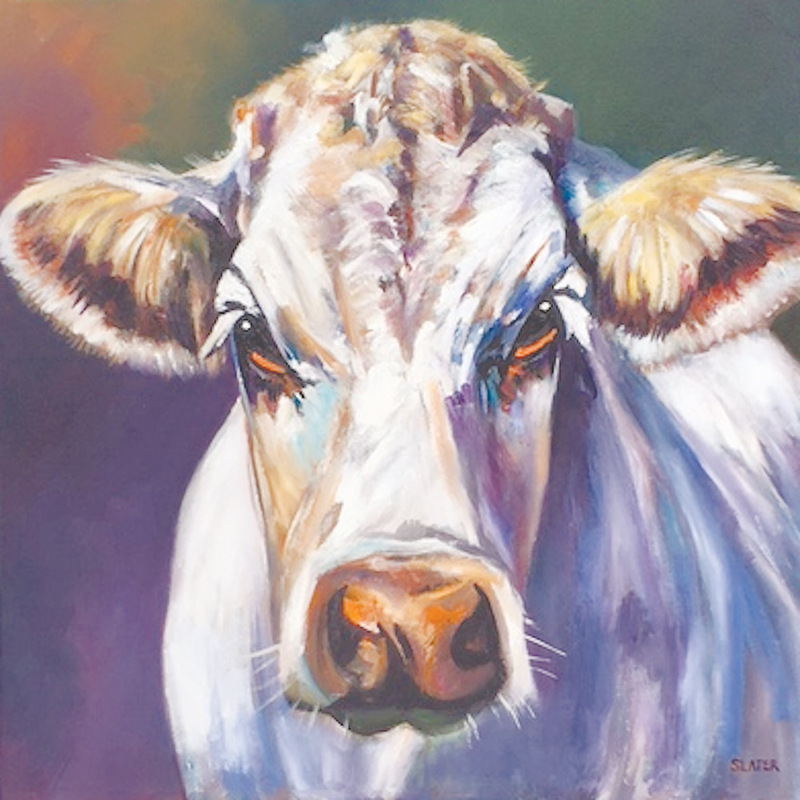 Betsy’s favorite subjects are landscapes and seascapes and her medium is oil on canvas. She captures the beauty and tranquility of the natural world on canvas. 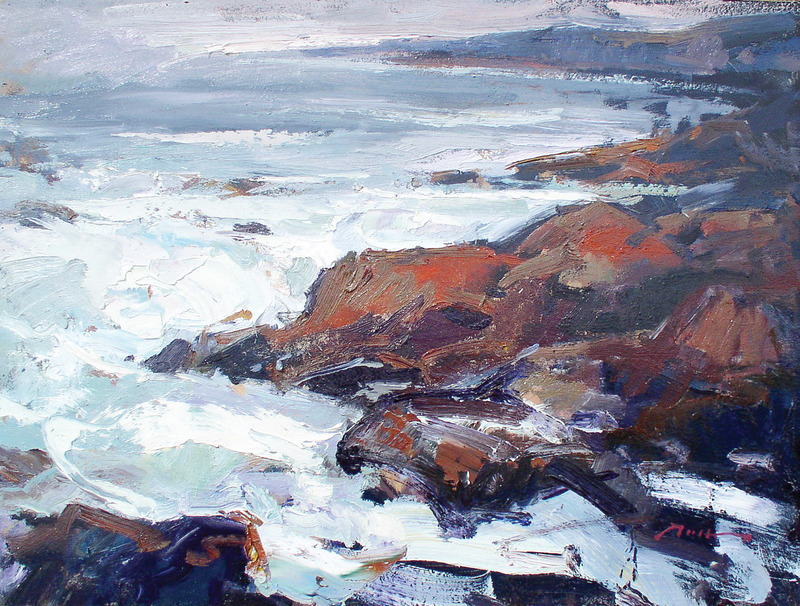 Her work reflects the love of the ocean, open spaces and remote, untouched areas. We are pleased to bring this exceptional artist to our gallery office. Please join us for First Friday where we will have light snacks and wine. SageBrushers artists Peggy Ogburn and Barbara Shannon. 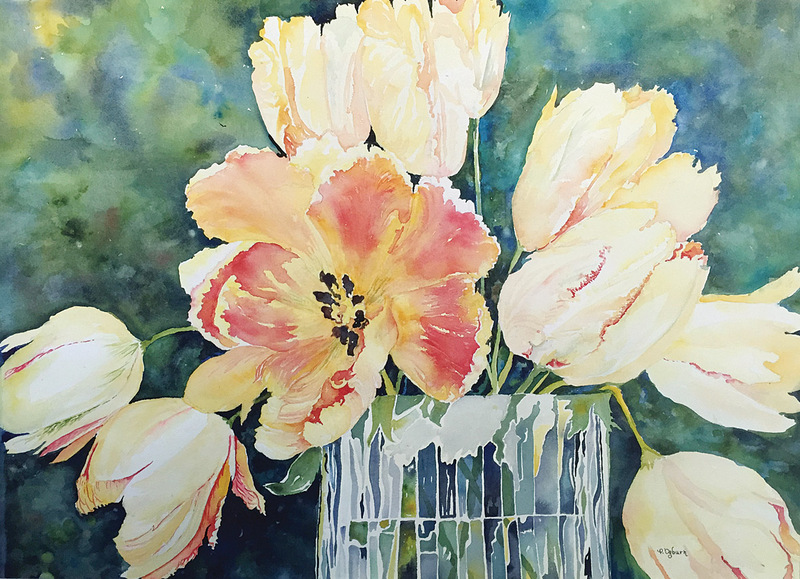 Peggy has found watercolor painting an inspiration with its flow of color so she spent the last few years mastering it. She uses transparent watercolorswith emphasis on negative painting. Peggy loves flowers and painting those is her specialty. Barbara liked to draw as a child and took a few art classes but did little with it until retirement when she took oil painting lessons and later watercolor. She calls herself a “copyist” and is trying to be more loose and creative. Sarah Helen More an abstract oil painter, inspired by textile designs. 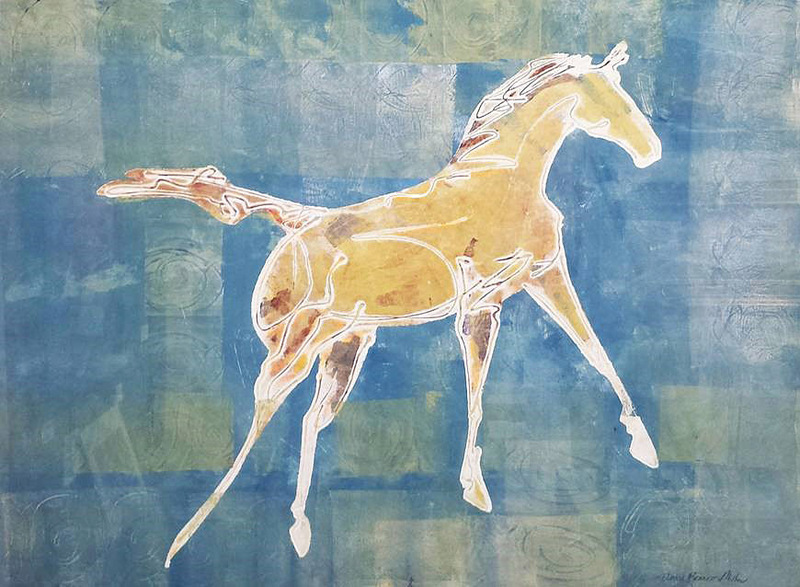 Welcoming Utah artist Richard Boyer in October show titled Catching Light. 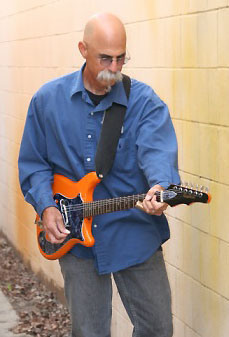 Serving wine and cheese and Rich Hurdle and Friends will be here to provide their jazz stylings for First Friday. Boyer will meet and greet everyone. Richard travels frequently throughout Europe and America. His landscapes draw on the traditional approach to oil paintings, but are contrasted by a richer textural quality. ings by Sondra Holtzman continues through October 25. 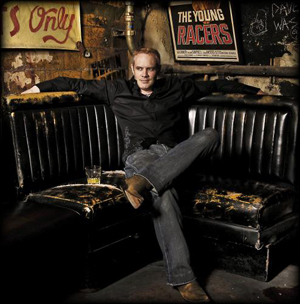 The artist will attend the champagne opening on First Friday. Holtzman retrieves discarded objects, tools and gadgets found in ghost towns, along the roadsides and in deserted places. Such acquisitions serve not only her concern for the environment but also provide subjects for her “rust prints.” Among the recovered trash/treasures is a stylized door-pull from a 1930’s playful image of a bakery chef. Her art career includes attending the Rhode Island School of Design and the California School of Arts and Crafts, education that furthered her artistic abilities. She worked as a freelance designer creating artwork for Nike and Delta Airlines. The Oxford lobby exhibition is open all hours. Billye Turner, art consultant, coordinates the hotel’s exhibition schedule with info at 503-780-2828, billyeturner@bendnet.com. 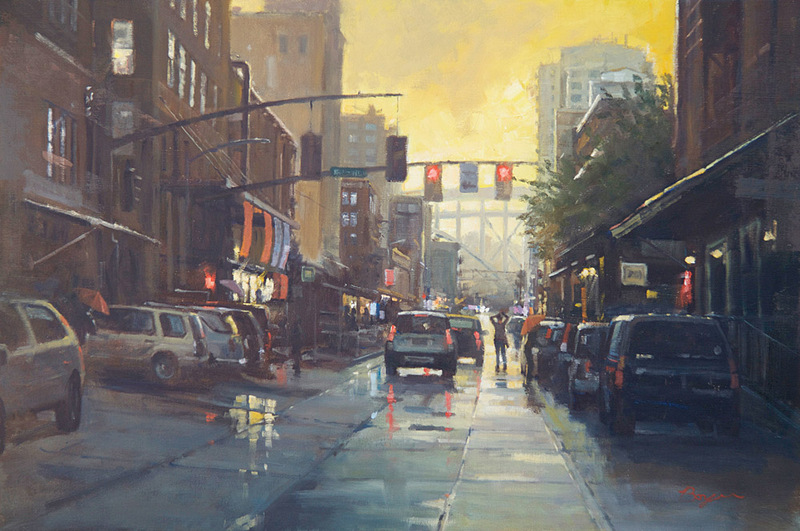 Fall Exhibition featuring the work of Central Oregon artists Ken Roth and Chris Cole. First Friday offers wine and cheese and both artists will be present to answer any questions. Roth has been working as an artist/educator for 25 years. He has taught art at all educational levels as well as conducted painting workshops. He considers teaching an integral part of his creative process. Ken is well-known for his oil paintings of birds, especially hawks and ravens and his abstract landscapes. 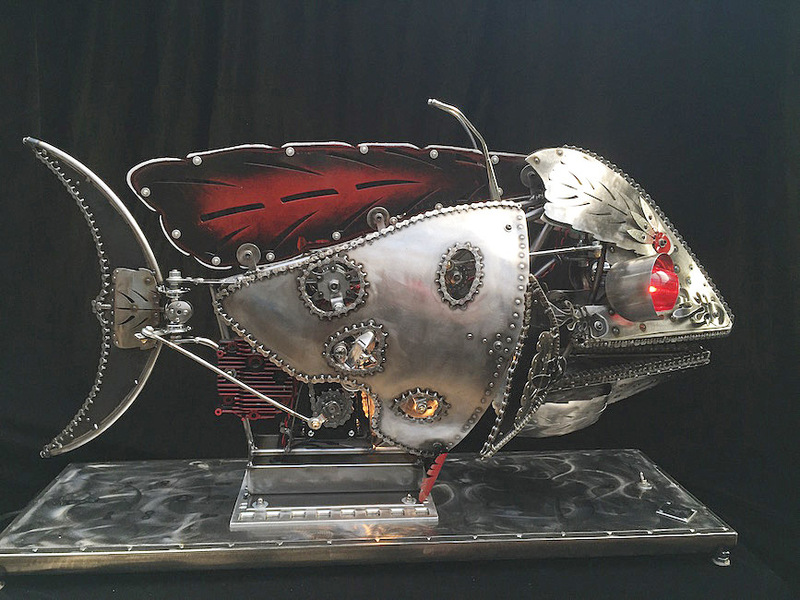 Cole brings life to incredible combinations of machinery and wildlife, creating wings from metal and glowing eyes made of recycled bike lights. As his animatronics twist and curl with a realistic grace, the inspiration from the natural world is apparent and surprising, given his chosen medium. 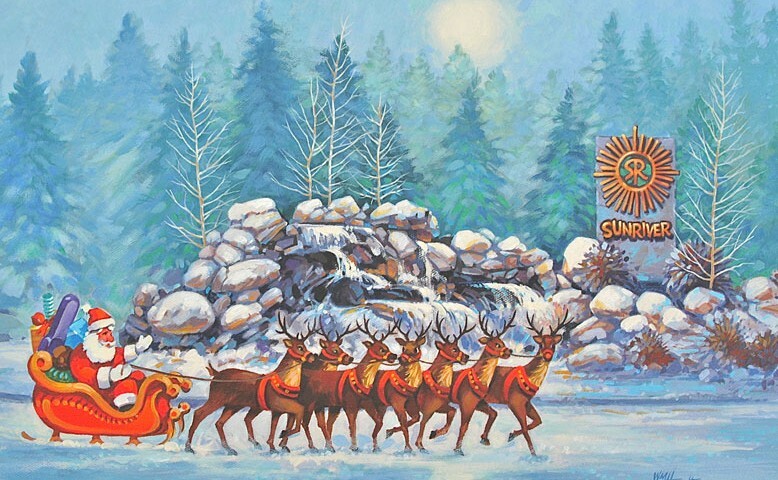 Kris Cranston ~ Painter was born and raised in Bend, living on a Tumalo farm since the ‘70s. After retiring from a 25 year teaching career with the Redmond School District she returned to Tumalo Community School to teach art. 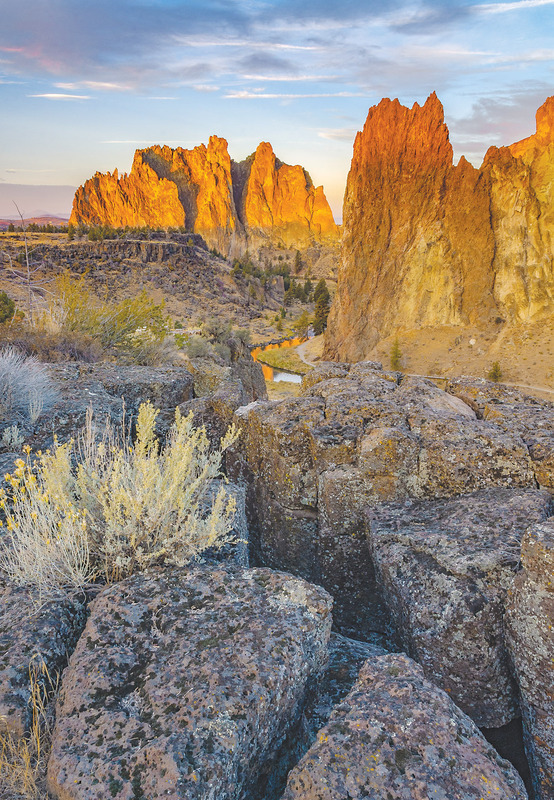 Dorothy Eberhardt’s photography of Central Oregon records the amazing beauty and special moments each one of us may have the pleasure of viewing but rarely capture. Each photograph honors the location or subject of her work in beautiful fashion. Linda Heisserman creates softly colored art that features beautiful carvings of nature in sensuously shaped pottery. Each piece is hand carved with great care and fired in a beautiful celadon green and soft blue. 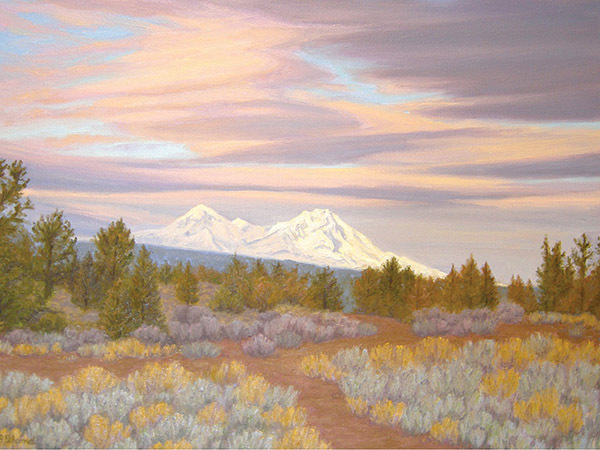 Lise Hoffmnan-McCabe is a plein air pastel artist and creates her special pieces on location throughout Oregon and Europe. Her technique allows the soft material of pastel to shine withan inner glow that is nothing short of delightful. Sacred Art at Good Grief Guidance. 33 NW Louisiana Ave.
Grief is the universal language. Whether through death, divorce, illness, loss of dreams, feelings of loneliness or abandonment, or ecologicaland social upheaval, grief is a normal, human experience. Journey into the sacred art of grief and discover how the pain and suffering of living is transformed into a place of personal empowerment — within the self, in relation to others, and one’s engagement withthe larger community. Indeed, grief and darkness deserve gratitude. Grief is an opening which allows healing and growth so that we may live into the beauty of who we are, and to find ourselves within one another. Just as we all live with grief, creation is a human calling. The brave graduates of the Good Grief program, including teens and adults from the community as well as men from the Deer Ridge Correctional Facility in Madras, have volunteered to share their newfound beauty of well-being with the larger community of Bend. We offer a visual representation of the transformation of grief through the e offerings at Good Grief Guidance. From weavings, paintings and photographs to poetry, love letters and personal mythologies, the channeling of the creative spirit enables us to reshape our life story so that we may thrive in the face of suffering. Please join us for food and drinks as we celebrate the loving wholeness which is ever present within each of us. Desert Art League join for a colorful show at Sage Custom Framing and Gallery. Six members of the group are participating. 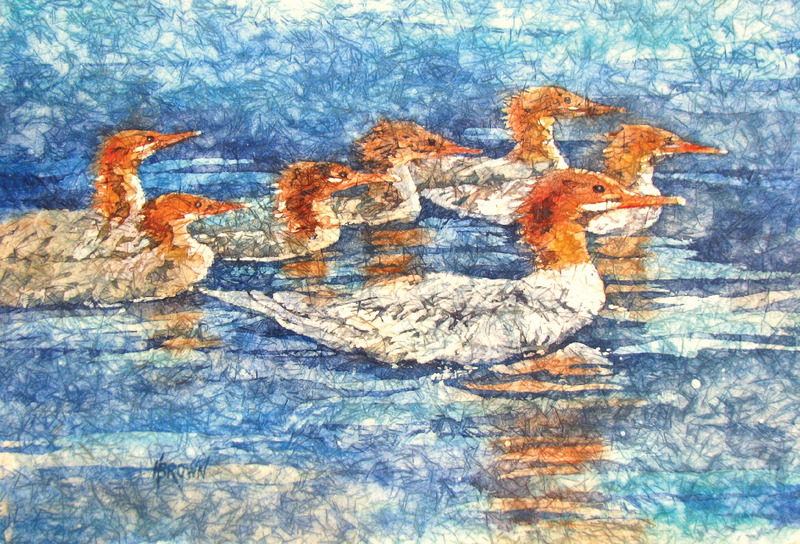 Helen Brown is known for her textural paintings on ginwashi rice paper. David Kinker uses the aesthetics of nature to inspire him in his art. 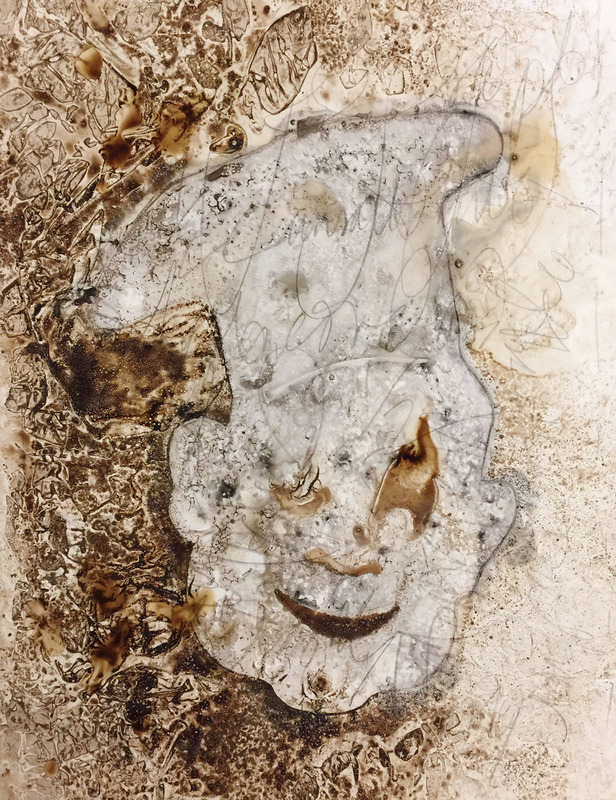 Janice Rhodes is an encaustic artist who embraces the unpredictability of this medium in beeswax. Dee McBrien-Lee paints almost exclusively expressive abstracts. 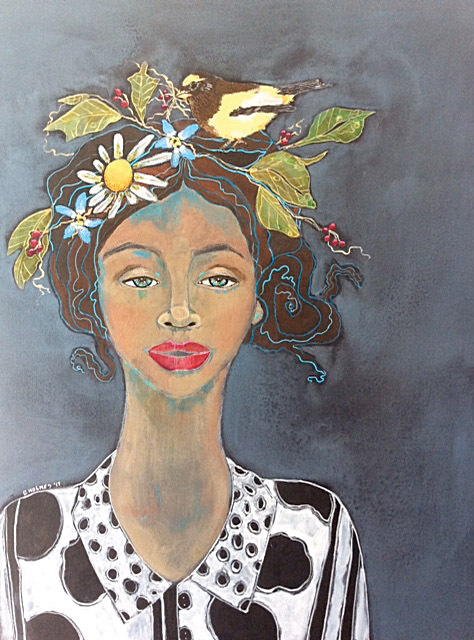 Jean Requa Lubin enjoys using oils as her medium to paint more representational paintings. Jacqueline Newbold uses colorful watercolors to create her playful landscape paintings. Featuring Galactic Fantasia, ink and watercolor by aspiring illustrator, Katie Culberston, who has been a Bendite for over a decade. Working with ink and watercolor Culbertson grasps the vibrancy and versatility of both media and expresses mood and style in her artwork focused on fantasy and particularly fantasy involving outer space. Miller opens her show, Fragile Beauty, Strength of Spirit. Well-known for her public sculptures Danae captures the spirit of both wildlife and ranch animals in her organic works. Working with poured wax that she forms into shapes to build her one-of-a-kind sculptures, Danae uses the fluid nature of the material to convey the energy of her subjects when cast in bronze or glass. “My work is influenced by my natural surroundings, and fueled by the textures, colors, and energy of life force. I have always lived in the company of animals and finding an understanding of how we relate and fit into the greater environment is part of my work,” says Danae. Utilizing her love of drawing and expression, Danae has found printmaking to be a complimentary medium and natural addition to her craft. Her monoprints show exquisite use of line, marks and subtle color. Embossing and shaping paper over forms she creates adds to the sculptural effects of this 2D process.